The Country of Origin Labeling regulations require most grocery stores to provide the country of origin for fish and shellfish, and the method of production (farm-raised or wild-caught), at the point of sale where consumers make purchasing decisions. 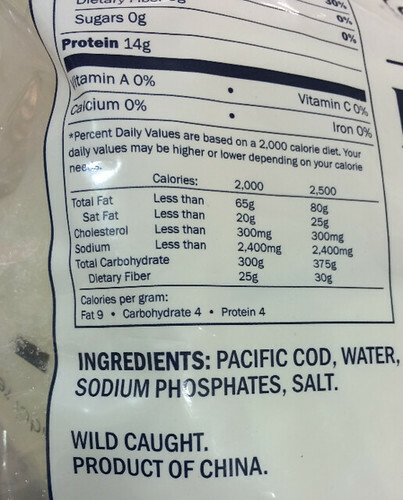 An example of this would be when a wild cod is caught off the coast of Alaska and, due to economic factors, is shipped to another country to be fabricated into fillets and packaged. If this process of turning a whole fish into packaged fillets occurs in China, the cod fillets are declared “Wild Caught Product of China” upon import into the United States. 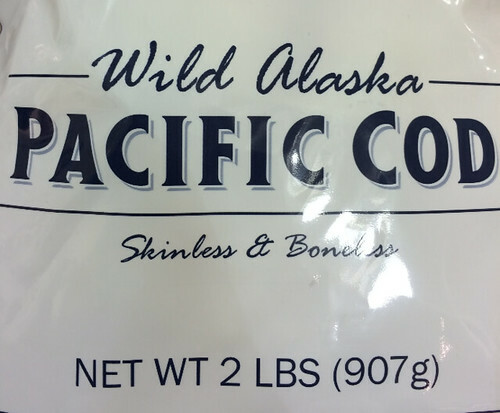 However, if the importer can demonstrate that the cod was caught in Alaskan waters, the packaged cod fillets are also eligible to say “Alaskan”. The Country of Origin Labeling regulations require most grocery stores to provide the country of origin for fish and shellfish, and the method of production (farm-raised or wild-caught), at the point of sale where consumers make purchasing decisions. Suppliers to retailers, including distributors, repackers, processing facilities, harvesters, and importers, are also required to convey this Country of Origin Labeling information to their subsequent buyers. The Country of Origin Labeling program, in close partnership with many State and Federal agencies, assesses labeling compliance in grocery store locations across the United States every year. In addition, the Country of Origin Labeling program audits the supply chain to verify the accuracy of country of origin and method of production declarations. Not only are seafood labels checked for mandatory country of origin labeling declarations, but much of the fruits and vegetables, peanuts, pecans, macadamia nuts, ginseng, lamb, goat, and chicken at your local grocery store must also include country of origin information. For more information about the mandatory Country of Origin Labeling program, visit: www.ams.usda.gov/cool. So is this exchange of cod part of the COOL Act that designates meat labeling changes? Trade has gone array while we were sleeping, it seems. Handling of food is not being monitored the way U.S. Americans believe. I knew about this issue and am glad to see it brought into the limelight. The more people know, then actions to stop bad practices can be best addressed. Why are the rules for some stores and not all? Name stores exempt from this requirement please. @Michael Pace - thank you for your question about which retail food stores are subject to COOL requirements. Stores that annually sell only small amounts of fruits and vegetables, and other retail fish markets and butcher shops that do not purchase fruits and vegetables for resale in an amount greater than the $230,000, are not considered retailers under this law and are not subject to COOL requirements. USDA has no authority to maintain records on the name and address of stores that are exempt from COOL requirements. There are more than 37,000 facilities nationwide that are required to provide country of origin information on covered commodities at the point of sale. They include national firms such as Walmart, Kroger, Safeway, and Costco. For additional questions about COOL, please visit: www.ams.usda.gov/rules-regulations/cool, contact the COOL Program by e-mail, cool@ams.usda.gov, or by phone (202) 720-4486. Is the USDA working to bring back labeling for beef and pork or is that requirement gone for good? @Kristen Waring - While the ultimate fate of COOL for beef and pork at the federal level was decided two years ago after Canada and Mexico filed a dispute with the World Trade Organization, proposals recently began circulating among certain states requiring retailers to indicate the country of origin of beef sold. Since 2016 retailers and their suppliers are no longer required to convey country of origin information for beef or pork products to their buyers and consumers under the mandatory COOL program. Imported beef and pork products sold in consumer ready packages however, must still bear the foreign country of origin under USDA’s Food Safety and Inspection Service (FSIS) regulations. In general, packers and retailers may voluntarily provide origin information to their consumers, as long as the information is truthful and not misleading. Packers and retailers should work directly with FSIS for guidance and label review. Country of origin information for the remaining covered commodities must still be conveyed to buyers and consumers. For additional questions about COOL, please visit: www.ams.usda.gov/rules-regulations/cool, contact the COOL Program by e-mail, cool@ams.usda.gov, or by phone (202) 720-4486. USDA’s Economic Research Service recently released a comprehensive study that sheds light on the issue of food labels, including COOL. The findings offers excellent background about retail compliance with COOL as well as consumer information regarding labels. For a copy of this report, please view the Beyond Nutrition and Organic Labels—30 Years of Experience With Intervening in Food Labels report. We only buy food grown and processed in the USA. If there is any confusion, we figure we can do without. All products packaged in China and Korea should be banned from entering the United States. Insane. I will never buy fish again in america until the USDA bans chinese imported and processed fish. China has ZERO health regulations and this once again shows the USDA putting Americans health at risk. Shame on you! Not COOL I do not trust the Chinese government. They are notorious for not breaking the law.